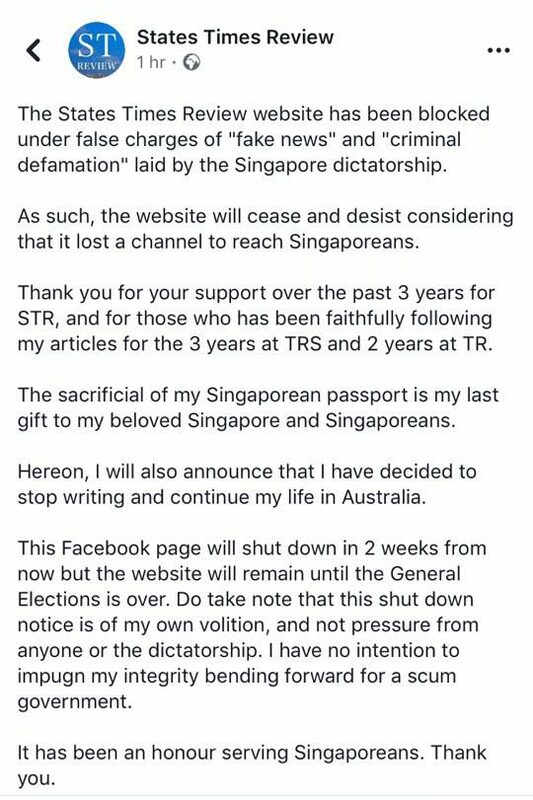 Anti-PAP website, States Times Review’s editor Alex Tan has announced on social media that he will be ceasing all website operations, after the Singapore authorities geo-blocked his website due to his refusal to take down a disputed article. “The States Times Review website has been blocked under false charges of “fake news” and “criminal defamation” laid by the Singapore dictatorship. As such, the website will cease and desist considering that it lost a channel to reach Singaporeans. “Thank you for your support over the past 3 years for STR, and for those who has been faithfully following my articles for the 3 years at TRS and 2 years at TR. The sacrificial of my Singaporean passport is my last gift to my beloved Singapore and Singaporeans. “Hereon, I will also announce that I have decided to stop writing and continue my life in Australia. “This Facebook page will shut down in 2 weeks from now but the website will remain until the General Elections is over. Do take note that this shut down notice is of my own volition, and not pressure from anyone or the dictatorship. I have no intention to impugn my integrity bending forward for a scum government. Despite Tan’s declaration that he will not restart the website, several netizens have opined that Tan will most likely go back on his words and return. Socio-political commentator Daniel Yap was one such voice. Published on 5 November 2018, the contentious article entitled “Lee Hsien Loong becomes 1MDB’s key investigation target” made statements that were false and malicious, such as statements linking Prime Minister Lee Hsien Loong and the Singapore Government to the 1MDB scandal, and impugned the integrity of the Monetary Authority of Singapore (MAS) as a financial regulator. The article further alleged that Malaysia had signed several unfair agreements with Singapore, in exchange for Singapore banks’ assistance in laundering 1MDB’s funds. The defamatory article has been deemed “baseless” by Law and Home Affairs Minister K Shanmugam, who has said that the authorities will take action against all parties involved. Earlier, MAS, Singapore’s central bank, filed a police report over the defamatory article. 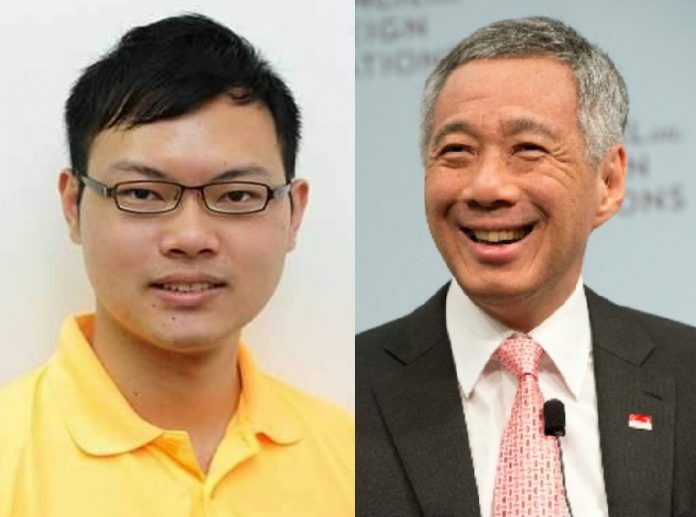 Alex Tan, the editor of the website later revealed on Facebook that the IMDA also sent him a notice to remove the defamatory article from his website. Tan refused to abide by the warning and defiantly shared the notice on social media, causing the authorities to make good on their promise and geo-block the website.